When it comes to surviving the apocalypse, the more weapons you have, the better off you tend to be. 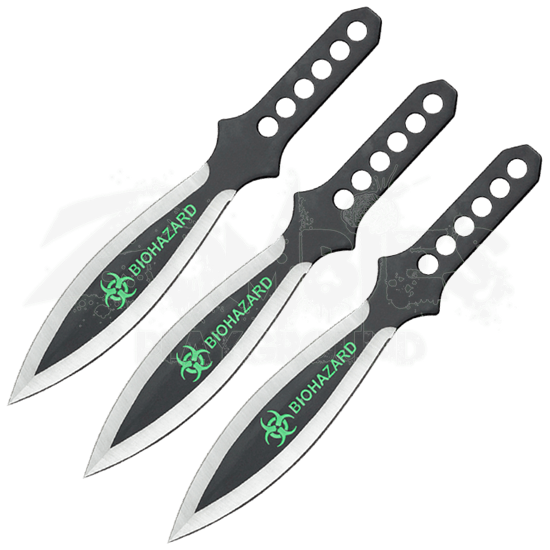 While they might appear unassuming, equipping the 3 Piece Biohazard Dual Toned Leaf Blade Throwing Knives could mean life or death! Forged from durable 440 stainless steel, this magnificent trio of throwing knives host a classic leaf blade construction with a shifted weight design that beginners and experts can handle with ease! The double-edged build is accentuated by the two tone finish, the blackened handles emphasizing the sharp silver edges. Six circular cutouts line up on the handle of each knife, shifting the weight forward toward the tip of the blade, improving the forward rotation and precision of your throw! A bright green biohazard symbol has been carved into the blade on a black background as if to warn the wielder to prepare for an inevitable horde. Theres no telling when danger will strike, so stow these three throwing knives in the durable nylon sheath for easy access at a moments notice. Whether you are preparing for the apocalypse or a friendly competition, you cannot go wrong having the 3 Piece Biohazard Dual Toned Leaf Blade Throwing Knives at your disposal!